A massive magnitude-7.9 earthquake has devastated Nepal – USGS estimates human casualties to cross 10,000 and economic losses of more than Nepal’s GDP ($19.3 Billion in 2013). The Nepali Students’ Association at MIT (MITeri) is joining hands with Help Nepal Network (HeNN) USA, a 501(c)(3) tax-exempt organization working in Nepal since 1999, to support humanitarian efforts on the ground. With this fund, the Nepal team will procure relief materials such as tents, food, and water, and organize transportation to dispatch items to the affected areas as soon as possible. We seek your contribution in immediate, intermediate and long-term relief and recovery efforts. Your donation goes directly to Help Nepal Network. Please don't display my name in the website. You will be redirected to PayPal after clicking on Continue. You DO NOT need a PayPal account to donate. I would like to donate my Birthday Party Gift to Nepal\'s Earthquake victims. It takes a long time to rebuild homes. Wish you all the best! Class of \'57, Course II. I have been to Nepal three times - in \'98, \'00 and in \'05. Best wishes and prayers for meaningful and timely relief efforts. Our friend at MIT told us about this organization. We are also sending lots of prayers. I would give more but have already donated via Save the Children. Nepal is such a beautiful country, and my heart goes out to the Nepalese. I hope they recover soon from the earthquake. As a Japanese, I wanted to help people who suffered from earthquake. I felt so sorry for this disaster happened to Nepalese people. Wish you can build up shortly. Hopefully all the money will go directly to the people who were victims of this deadly disaster. Thanks so much for setting this up, just so devastating. Wish Nepal all the best! $10 may not be much, but if everyone donates even just a few dollars, it will all add up! This includes a contribution from my father who wanted to help out too. Thoughts and prayers with Nepal. Be strong! Everything will be fine! Prayers across the miles. We are all thinking of you. thank you for doing this. prayers to Nepal. I am very sorry to hear the news and hope Nepal survivors will soon recover from their losses. My heart goes out to Nepal. Stay strong Nepal! We will bounce back! In conjunction with MIT Media Lab, MITeri co-hosted Hack for Nepal, a hackathon-inspired brainstorming session to discuss and share ideas for Nepal’s recovery, on May 1. You can read the featured story on Medium. A follow-up session will soon be organized in the near future, details of which will be posted here. Tech-savvy members of the MIT community and beyond are welcome to attend. 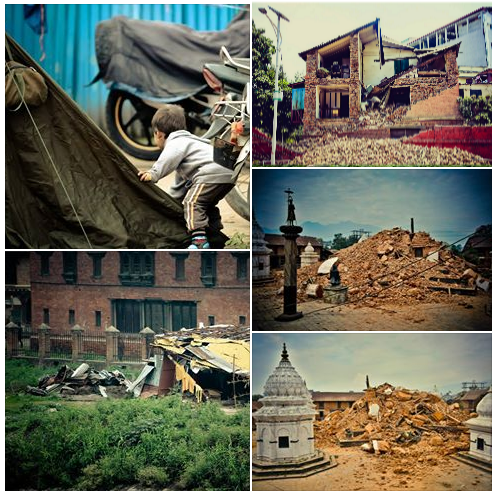 Our partner organization for dispatching relief supplies to the hardest-hit districts, Help Nepal Network (HeNN), has been providing updates on a regular basis via their Facebook page. Help Nepal Network uses its own Trust Fund to cover administrative costs so that every penny you donate goes towards sending tents, food, medical supplies and other necessities to the affected areas. You can review their overhead policy here. We encourage you to follow their progress on the ground and help MITeri continue its fundraising efforts. Please share our link with your friends, colleagues and family members. When possible, please ask your company to match the charitable donation. Thank you. The organization that we are sending 100 percent of our processed donations, Help Nepal Network (HeNN), is actively working on ground to supply relief materials. All the donations go to charity and not to administrative costs. We are regularly communicating with them about their efforts. Read this latest update from HeNN's facebook page that details their work on May 2nd and 3rd. To read updates about their work before that, see their facebook page. For further updates, please like the page. We are being overwhelmed by the support and efforts shown by the MIT community. We have almost reached one-fourth of our goal. We would like to thank MISTI-India, MIT Music and Theater Arts, MIT Ohms, Japanese Association at MIT, MIT European club, and other groups that have supported us in our fundraising efforts. Beyond groups, the support of individual MIT students is incredible --vast majority of the donors we have had are students.. Thank you for taking time to donate at booths or online, even with your busy schedule with finals nearing. To comply with MIT internal policies governing the use of student groups in fundraising and to channel 100% of donations to charity without losing contributions to platform and processing fees, we (MITeri) have decided to set up our own website for collecting donations. The initial fundraiser on GoFundMe will stop once it has reached its goal. The donations you make on this website directly go to Help Nepal Network USA (HeNN), a US-based 501(c)(3) organization that is working on the ground. Given its track record in assisting natural disaster victims in Nepal, commitment to transparency and leadership that includes several MIT alumni, we trust the organization to understand and respond to the needs in the most effective way. We will continue working with HeNN to ensure that the funds are judiciously utilized. We will need your continued support in the long road to recovery and reconstruction. Thank you. Our booths will be set up at MIT in student center on Monday and Tuesday and in lobby 10 on Wednesday, to collect funds in cash, techcash, Venmo, and debit/credit cards. We will be there until 5 pm on Wednesday, May 6th. For Venmo, you can pay to "MITeri Nepali Student Association". Please use the following form or drop a line on miteri@mit.edu to contact us. We will respond as soon as possible. Created by MITeri in response to Nepal's 2015 Earthquake Disaster.